Just recently, fossilised remains of a tropical to subtropical champsosaur, as well as turtles, have been unearthed on Axel Heiberg Island at 79°N in the Queen Elizabeth Islands of north-eastern Canada.5 A champsosaur is an extinct crocodile-like reptile assumed to have lived in a habitat similar to the modern crocodile. The strata are dated as late Cretaceous within the uniformitarian geological time scale. What is so perplexing to uniformitarian scientists is that the 2.4-metre-long champsosaur is cold-blooded (an ectotherm). Furthermore, it cannot migrate or hibernate during winter, as is thought possible for some polar dinosaurs and turtles. Uniformitarians therefore consider the champsosaur an ideal climatic indicator. According to uniformitarian presuppositions therefore, what are the climatic implications of this new fossil find? Using crocodiles as an analogue, the climate must have been tropical to subtropical. More specifically, the warm season temperatures very likely ranged from 25°C to 35°C with the coldest month mean temperature of about 5.5°C.6 Thus the annual mean temperature would have been greater than 14°C. This compares with –20°C for the present annual mean temperature for the area and –38°C for the coldest month mean temperature. The lowest daily temperature during the coldest month would likely be around –45°C with a record low of about –55°C. You cannot get anymore of a climatic contrast between the present climate and the climate inferred from the fossils. Manipulating Cretaceous CO2 is another favourite modelling attempt. The modellers usually specify 2 to 8 times more CO2 in the atmosphere in their simulations than today. Not surprisingly, these simulations do warm up the polar areas significantly. Initially the simulations just used mean annual temperatures and generally gave above-freezing polar temperatures in winter. However, it was recognised that such simulations are not accurate because they do not account for the seasonal cycle. When the more accurate seasonal cycle simulations were applied with boosted CO2, the results were less dramatic. At 4 times the present CO2, the continental winter temperatures at mid and high latitude using presumed Cretaceous geography were below –20°C.12 The 6 times CO2 simulation was better, but still inadequate. The problem with cranking up the CO2 is that the tropical atmosphere and oceans overheat.13,14 The whole exercise is quite unrealistic. What about increased poleward oceanic heat transport, which is a significant factor in warming winter temperatures at higher latitudes today? Modelling showed that a modest increase in poleward heat transport produced only a slight warming.13 Sloan et al. concluded that there is no known mechanism to significantly boost the poleward oceanic heat transport,10,14 and proposed instead increased atmospheric heat transport.10 The problem with this idea, however, is that atmospheric poleward heat transport is proportional to the north-south temperature difference. Any mechanism to warm polar temperatures decreases the north-south temperature gradient and, hence, the higher latitude heat transport. Barron et al. suggested that the Cretaceous climate can only be reproduced if all warmth-boosting mechanisms are invoked.15 They presented the results for presumed Cretaceous geography with 4 times the CO2 and a 30% increase in poleward oceanic heat transport. Unfortunately, they did not show the cold season temperatures, just the mean annual temperature, which in the above simulation was still below freezing over north-east North America and northern Eurasia. This means that the average cold season temperatures would have ranged from –10°C to –20°C. The contradiction between the paleofauna and the uniformitarian paleoclimate is so great that one wonders why scientists do not question the uniformitarian paradigm. Huber, B.T., Tropical paradise at the Cretaceous poles? Science 282:2199–2200, 1998. Return to text. Oard, M.J., Where is the Flood/post-Flood boundary in the rock record, CEN Tech. J. 10(2):258–278, 1996. Return to text. Oard, M.J., Polar dinosaurs and the Genesis Flood, Creation Res. Soc. Quart. 32(1):47–56, 1995. Return to text. Oard, M.J., Mid and high latitude flora deposited in the Genesis Flood Part I: uniformitarian paradox, Creation Res. Soc. Quart. 32(2):107–115, 1995. Return to text. Tarduno, J.A., Brinkman, D.B., Renne, P.R., Cottrell, R.D., Scher, H. and Castillo, P., Evidence for extreme climatic warmth from late Cretaceous Arctic vertebrates, Science 282:2241–2244, 1998. Return to text. Tarduno et al., Ref. 5, p. 2242. Return to text. Huber, Ref. 1, p. 2199. Return to text. Oard, M.J., Ice ages: the mystery solved? Part II: the manipulation of deep-sea cores, Creation Res. Soc. Quart., 21:125–137,1985. Return to text. 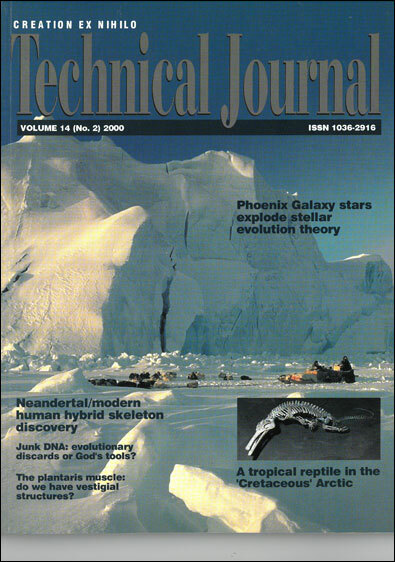 Barron, E.J., Fawcett, P.J., Peterson, W.H., Pollard, D. and Thompson, S.L., A ‘simulation’ of mid-Cretaceous climate, Paleoceanography 10(5):953–962, 1995. Return to text. Sloan, L.C., Walker, J.C.G. and Moore Jr., T.C., Possible role of oceanic heat transport in early Eocene climate, Paleoceanography 10(2):347–356, 1995. Return to text. Barron et al., Ref. 9, p. 957. Return to text. Barron et al., Ref. 9, p. 958. Return to text. Barron et al., Ref. 9, p. 959. Return to text. Huber, Ref. 1, p. 2200. Return to text. Barron et al., Ref. 9, pp. 960–961. Return to text. Balling, Jr., R.C., Global warming: messy models, decent data, and pointless policy; in: Bailey, R. (ed. ), The True State of the Planet, The Free Press, New York, pp. 83–107, 1995. Return to text. Tarduno et al., Ref. 5, p. 2243. Return to text. Oard, M.J., Mid and high latitude flora deposited in the Genesis Flood Part II: a creationist hypothesis, Creation Res. Soc. Quart., 32(3):138–141, 1995. Return to text. Woodmorappe, J., A diluvian interpretation of ancient cyclic sedimentation; in: Studies in Flood Geology, 2nd ed., Institute for Creation Research, Santee, California, pp. 199–220, 1999. Return to text. Coffin, H.G. with Brown, R.H., Origin by Design, Review and Herald Publishing Association, Washington, D.C., pp. 41–53, 1983. Return to text. Austin, S.A., Mount St. Helens and catastrophism; in: Walsh, R.E., Brooks, C.L. and Crowell, R.S. (eds), Proceedings of the First International Conference on Creationism, volume I, Creation Science Fellowship, Pittsburgh, Pennsylvania, pp. 3–9, 1986. Return to text. Scheven, J., The carboniferous floating forest—An extinct pre-Flood ecosystem, CEN Tech J. 10(1):70–81, 1996. Return to text.